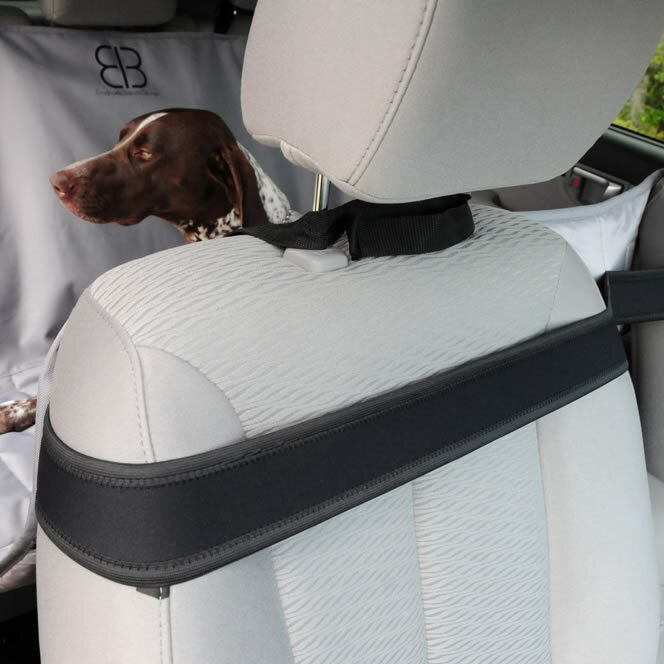 The Hammock Seat Protector from Emmanuel Bianchi protects your cars back seat from dog hair, dirt, mud and everything else that your dog brings in the car! Constructed with extremely durable polyester, the underside is made with an anti-skid mesh to make it stay in position nicely, and the ingenious neoprene belts solidly anchor the two loose corners to the seat. It also makes for a very comfy space for your dog/s to ride (especially larger dogs), harnessed in of course! 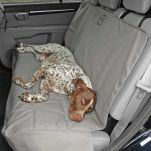 There are openings in the seat cover where your dog's seatbelts can be put through to ensure your dog's safety. Additionally the cleverly designed headrest belt can be used to cross around the seat "shoulder" if the headrest is not available (usually on older cars). Also available in XL for Larger SUVs. Excellent cover, I owned a cheaper one before and it just did not sit right and slipped all over the place. This cover is extremely durable and the rubber backing is a bonus. The standard size was a little to small for my 2010 camry However it still fits well and will not move around. I put a comfy bed mat on the back seat and now i call it Lola's Lair :) If you want a cover and are unsure about spending the money... It's well worth it, way better then the cheaper kinds. My Husky and Mini Foxy totally love their new Hammock. It's the best Hammock I've bought and I think it will last forever. Previously I had a Kurgo and it failed prematurely, the EGR EB Hammock Seat Protector leaves the Kurgo for dead. I'm extremely happy with the product. It is functional, strong, durable, looks great, classy and my pup likes it. She has stopped slipping around when we need to stop or turn quickly. It protects the leather seats from staining and tearing. It's easy to whip off and on if I'm carrying people in the back seat. I am happy I paid that bit extra for a superb product. 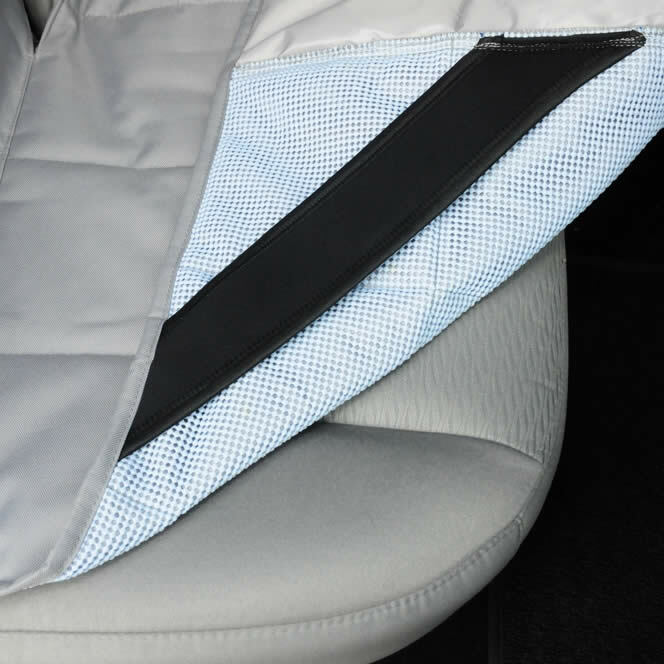 Read 8 customer reviews of EGR EB Hammock Seat Protector. The average customer rating is 5. We purchased our EGR EB Hammock seat protector 3 weeks ago. We have had our Two dogs at the beach, in the rain and mud on there daily walks. The protector has out performed our expectations. What a great fit for our Nissan Patrol a simple hearth brush brings away sand and mud. It doesn't hold on to dirt and always looks clean. It also stays firm to seat and does not move around, we love ou protector & wouldn't hessitate to recommend this product. Functional, quick and easy to install, folds up easily for storing and comfortable for Nelson and Wolfgang. A wonderful product. Would certainly recommend. Once again waggle service was top notch! If you want to buy the absolute best Hammock available, you won't buy better than the EGR EB. You're dogs will be perfectly safe n secure, not to mention very comfortable. The ability to purchase online and have it delivered promptly to my door was an absolute bonus too! Exceeded my expectations. With a 55kg Dogue sitting on my leather seats, you can imagine the wear and tear and damage those toe nails were doing to my seat, which was covered with a generic vinyl style seat protector. I needed something that was going to actually “work” as per the description on the packaging and EGR EB Hammock Seat Protector is outstanding. It is thick so as to prevent his nails piercing the seat, it covers the back and front seats really well, has a fantastic grip surface on the back which prevents it and him sliding around, is easy to clean as just through in the washing machine, is water proof enough to prevent his drool and wet feet from penetrating to the seat. Overall so extremely satisfied with this value for money produce, would highly recommend to anyone seeking a seat protector that works! important thing Punch loves it. She's at day care now, but will take photos of her over the weekend in her Hammock. 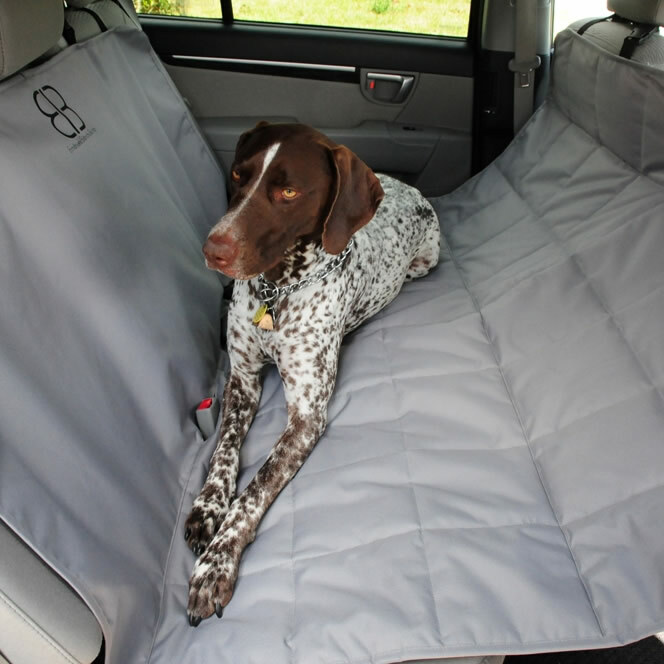 This is great for protecting your car seat from hair & damage plus keeps your beloved pet safely in the back seat. 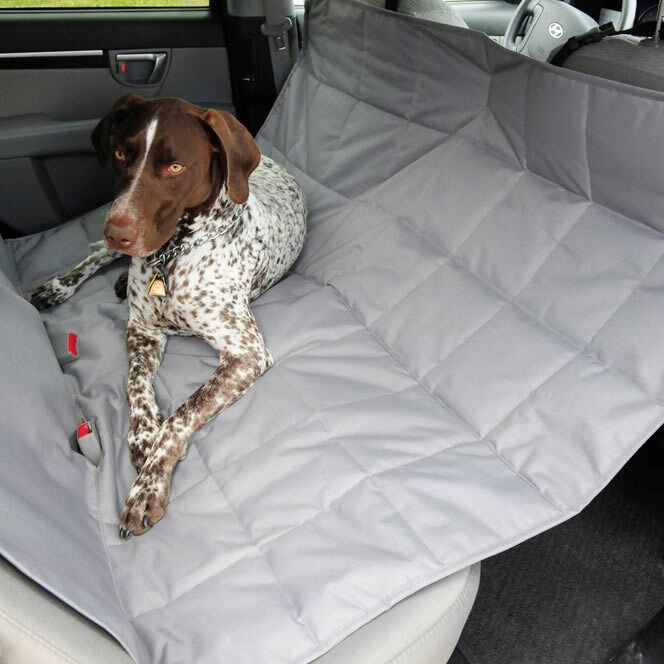 The rubber anti-slip backing on the bottom is a stark improvement to our old one as it stops the seat protector from moving around so makes for a more comfortable ride for your dog (& means you don't have to keep adjusting it before each use). The high sides to this hammock mean that your dog is prevented from coming into the front if you have to brake hard etc plus the clips on the straps holding the protector in place appear strong & durable. Highly recommended by us & our car-ride-lovin mutt!